If you run into any issues, please leave a bug report along with any error message and what you were trying to do at the Idea Informer. Please read the README if you want some more info on setting up Ved. → On all OSes, this means last modification dates are now displayed next to levels. Also, newlines no longer split filenames into different non-existent ones (#45). And in general, it's way more professional. Thanks to Info Teddy for his contributions this version. Ved now blocks forbidden characters for your OS in filenames, instead of relying on the OS to block them. Reason: Windows and the : character. Optimized drawing tiles and horizontal/vertical warp direction backgrounds by using SpriteBatches. In other words, better performance! Q (quick go to room) feature clarified to say "Go to room"
Warp lines now stop at and go through the correct tiles, consistent with VVVVVV, and no longer behave inconsistently with certain tiles. Saving an image of the map can now be done in more sizes, you can choose a part of the map to export, and more. You can also immediately open the saved picture in your image viewer. You can now also cut/copy/paste/undo/redo from the map screen, shortcuts included. Script jumping feature in editor (Create/Go to) now looks at the full line, instead of just to the left of your cursor. Saving levels should now happen much faster if it was taking a long time. Text now uses proper singular/plural/number forms (no more "check(s)" or "1 usages"). Languages with other plural rules are covered too. A level can now be saved only once after a crash, meaning you can't spam the S key anymore to get a trillion files. Now you have to press R before saving another time if you really want it. Fixed thread error on levels list if a level with an unmatchable metadata item exists. Unfinished flag commands with an empty flag name/number, like "ifflag(", will no longer be turned into "ifflag0("
Fixed crash that would happen if you unchecked the "Used" or "Unused" box in the script list, chose a script, and then returned to the script list. Vastly improved the undo system - all entity changes can now be undone and redone properly, along with metadata, room metadata, and some other operations that can be done on rooms, like copy-pasting and swapping. Some bugs in it are now fixed as well. The "Are you sure you want to quit?" dialog is now replaced by a dialog that only shows up if there are unsaved changes, which asks if you want to save first (ia=103334). Also added an asterisk indicator in the window title to indicate unsaved changes. Added shortcut revealing feature for buttons, you can now see keyboard shortcuts for most buttons by holding F9 anywhere within Ved. Added a temporary flashing border around the current room on the map, to make clear what the current room is when you go to the map. You can now move to different rooms on the map, using the arrow keys. The help/level notes system is now a lot more optimized for very long articles/notes and for many different colors on a line. The "originally last modified" timestamp is now also saved on Windows if your username has spaces, and/or if you happen to still be using Windows XP. Fixed a crash that would happen on Windows if the levels folder uses a trailing (back)slash or uses slashes instead of backslashes. Just like the one in the script editor, the "Copy" button in the level notes editor now becomes yellow for a bit when it is clicked, to indicate that it has worked. Added proper subdirectory support for the levels folder. Subdirectories are now shown as such and can be navigated, and saving a map image when the level is in a subdirectory now also works. The scale setting can finally be changed using -/+ buttons to a value of 1-9. As a bonus, the value will be red if it's higher than what fits on any of your displays, and that is calculated dynamically. Added basic command completion in the script editor - Pressing TAB will complete any simplified/internal command, if there's a single match. This can be useful when having to type longer commands like backgroundtext a lot. Added state number allocation system for plugins, which makes implementing custom states in plugins much better! See the technical documentation for more info. Added / shortcut to script list, to jump to the topmost script, which is the latest opened one. Fixed a bug where both placing the entrance and the exit of a warp token were counted as new entities. Added feature to easily create load scripts: When typing the name for a script box or terminal, press shift+enter to create a load script with an unused flag, and ctrl+enter to create one with iftrinkets(0,script). Ved now supports command line arguments, so you can pass it a level filename to load, or start a new level, for example. 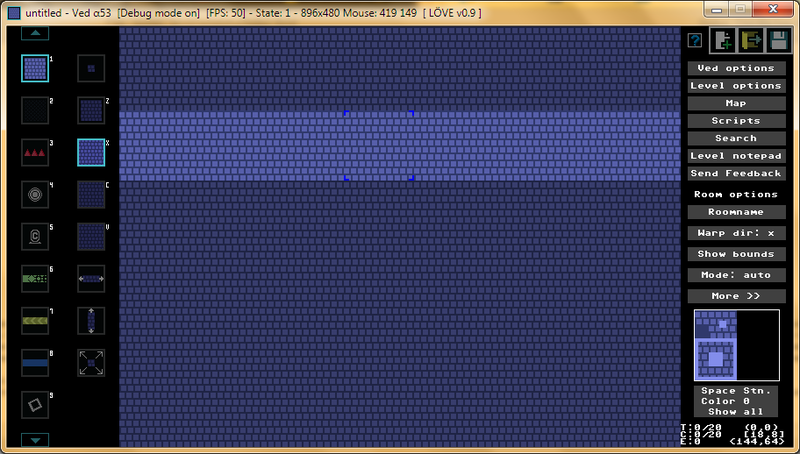 Tilesets and sprites and the list of levels are no longer loaded every time the levels list is opened. Instead, to reload the tilesets and sprites, you can press F11, and to reload the levels list, you can press F5 there. Added an indicator in the main editor that tells whether displayed coordinates start at 1 or 0. Plugins can now have .lua files in an include folder, and they can then be included with ved_require() as if they were in the main Ved source folder. Added gray background to names for script boxes and terminals, to make them more easily readable when there's roomtext or white tiles underneath. Several other less-major changes, bugfixes and updates were made. You can check the commit history for more details. Also please be aware that the version number is incorrectly indicated as 1.0.1 in this version. When in smaller screen mode, the clickable area for levels on the load screen is now properly made smaller too. When saving/converting/splitting an internal script is caused to fail (by having way too many lines between a text command and its speak/speak_active) the script will no longer come out broken, because internal scripting mode is now simply disabled in such an event. Finally added a complete internal scripting reference. It may still need some improvements, feel free to give feedback. The level comparison feature now also compares flag names and level notes! Added the option to disable checking for updates on startup. 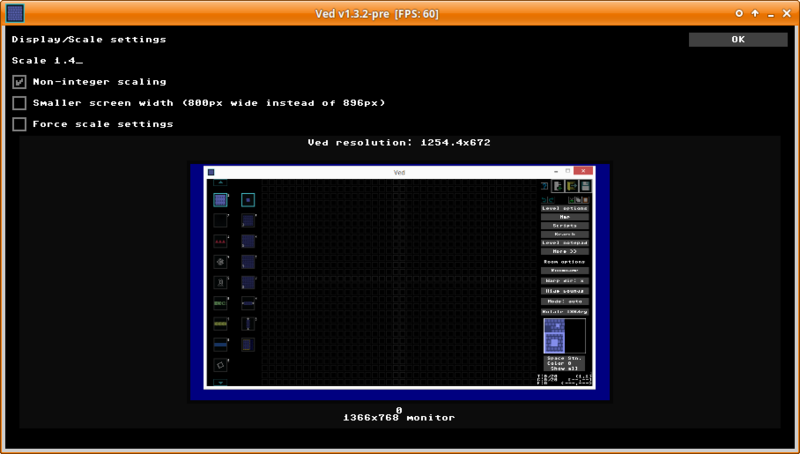 Ved is now officially no longer in beta, and proper Windows and Mac executables are distributed from now on! 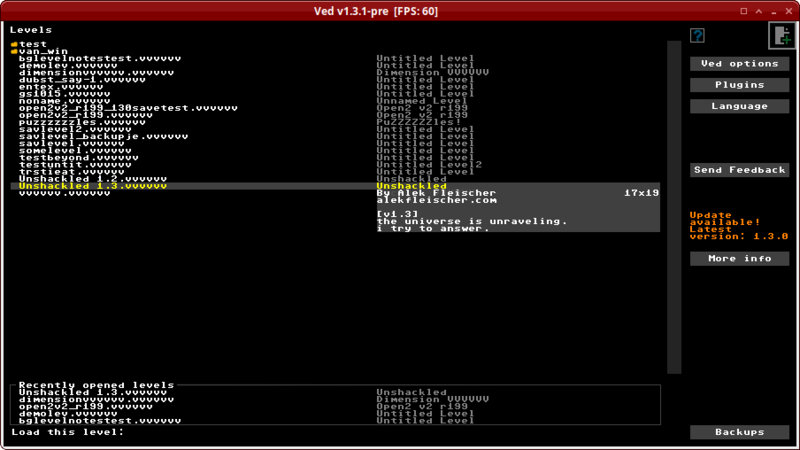 Malformed (or missing XML in) level files now cause an error message to be shown, instead of crashing Ved. You can now place left and right corners of enemy/platform bounds on top of top left corners of existing enemies/platforms respectively. (Re-)added "change to horizontal/vertical" option for gravity lines (correctly this time). The entity counter would be incremented both when placing the top left of a script box and when placing the bottom right, and another two times when moving/resizing a script box. This has now been fixed. More shortcuts in the main editor: / to go to the script editor, ctrl+/ to go to the level notepad and ctrl+F to go to the search screen. When going up or down in a script with the arrow keys, the script will now scroll automatically when the cursor is (about to go) offscreen. The same goes for pageup and pagedown. Added Russian translation by CreepiX, and Esperanto translation by Format. If you have either of them in your %appdata% lang folder already, please make sure to take them out, because some things have changed. The compare function now displays room coordinates instead of room numbers for room metadata, and displays entity type names instead of numbers. Forgot to make a couple of files that I made not long ago LF instead of CRLF, making them hard to mod, whoops. Made the help and the tools bar better in small screen mode, there's now "CTRL" to indicate that's the button which shows the tools menu, and the current tool is always shown. Several other issues with smaller screen mode were also fixed. If your scale setting is set so high that the window won't fit on your monitor (any of your monitors) then the scale will be reset to 1. Also, if it is detected that you don't have a monitor that has a resolution of at least 896 pixels wide, then the smaller screen mode will be activated automatically. When clicking the Split button in the script editor and canceling out of that, input would no longer be accepted. This is now fixed. Monitor interface-like arrow keys enemy/platform bounds system replaced by a system where you click the top left and bottom right corners of the bounds. Finally, scroll bounds when scrolling down! If you try to place a gravity line in a wall (which can't be done), it won't be added to the entity count. 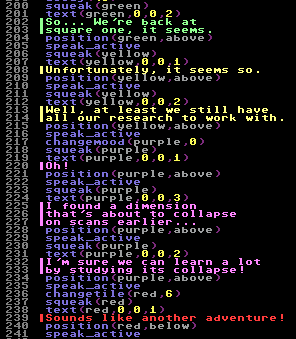 It's now possible to use multiple text colors on a line in the help/level notes/plugin descriptions, see the Formatting page in the help for more information. There are also some more colors available (cyan and yellow). Fixed crash when going to a non-integer line in the script editor using the "Go to line" function, and some other issues with this. Moved some functions around in the code, so if you made a plugin and it broke, that's probably why. Most important changes are moving of script-related functions from func.lua to scriptfunc.lua, moving of a couple of search-related functions to searchfunc.lua, I moved some room-related things that were in func.lua to roomfunc.lua, and some state drawing code is now moved from main2.lua to separate files drawscripteditor.lua, drawlevelslist.lua, drawsearch.lua, drawmap.lua and drawhelp.lua. In addition to the internal scripting load script warning (see b8 changelog), there's now also a warning in the editor if a terminal/script box is pointing directly to the current internal script. Made the "Map image saved" message clearer, it now says which folder the screenshot is saved to. In the meantime, discovered and fixed a partial incompatibility of the map image saving feature with LÖVE 0.10.x, caused by a terrible way of coding. (clicking the save button normally worked, as well as right clicking to save a full-sized image, but right clicking and saving a normal-sized image still had non-updated 0.9-only code). The room copying and swapping tools next to the map now show a message about what to do. If you load a level correctly, then go to the loading screen and try loading a level that doesn't exist, then go back to the editor, Ved will no longer crash. Added the ability to compare two levels with each other to show what the differences between them are! (Press ctrl/cmd+D when the newer version of the level is loaded). Comparing differences for flag names and level notes still needs to be implemented. You can now no longer place two entities of the same type on top of each other by just clicking, because it can happen accidentally and go unnoticed. You can still place them on top of each other by editing their properties. Edit: Please do not save levels with this version, as you will lose all your room metadata and scripts! If you try to load a level that doesn't exist now, you won't be able to go "back" to the editor and crash Ved by doing that. Bug where you'd get the message "The old start point can no longer be found!" when trying to place the start point fixed. 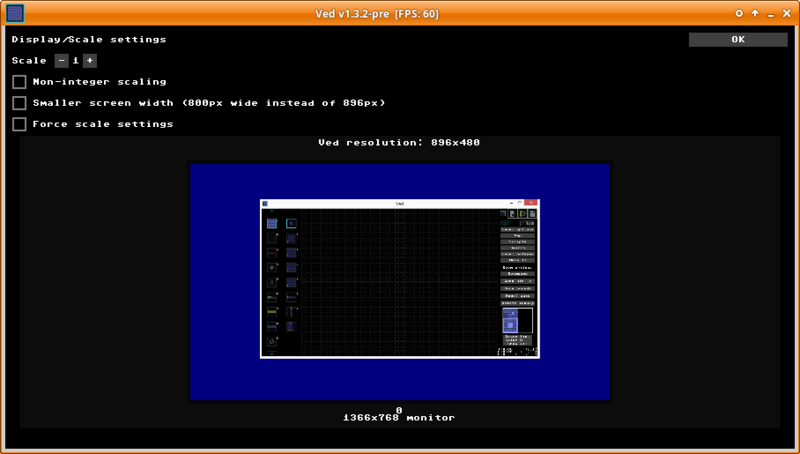 Mode for smaller resolution (Pandora) now works partially (you'll need to edit the config file). Hold ctrl for the left tools menu in this mode. 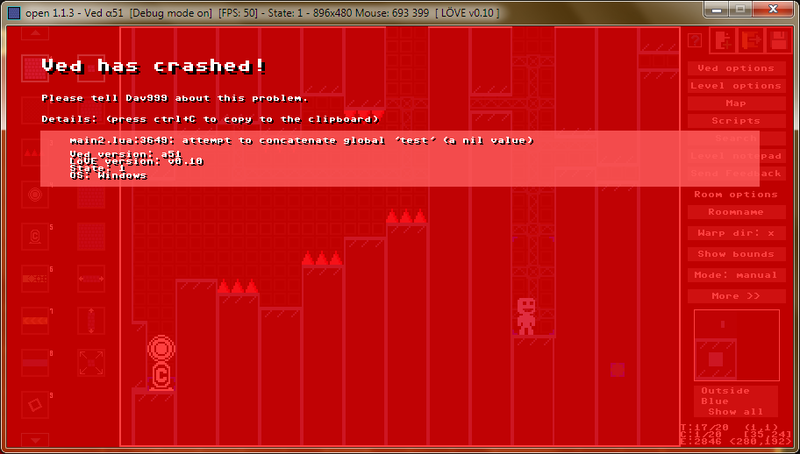 Whenever Ved crashes, you can now (attempt to) save the level you were working on after the crash! It is now possible for plugins to find and replace internal Ved code, for maximum plugin flexibility! See this page for more information. It should now no longer be possible that flag names are being assigned flag numbers that are also being used in that script for the first time. If you use the "Go to line" button in the script editor, you'll no longer be unable to continue editing the script. If a level fails integrity checks, the dialog now displays up to the first 5 errors that were encountered. PageUp and PageDown can now be used to scroll quickly! (If you were relying on PageDown to change the FPS limit: use rctrl+PageDown now) PageUp and PageDown also move the cursor, but you can make the cursor and the actual scrolling get out of sync. 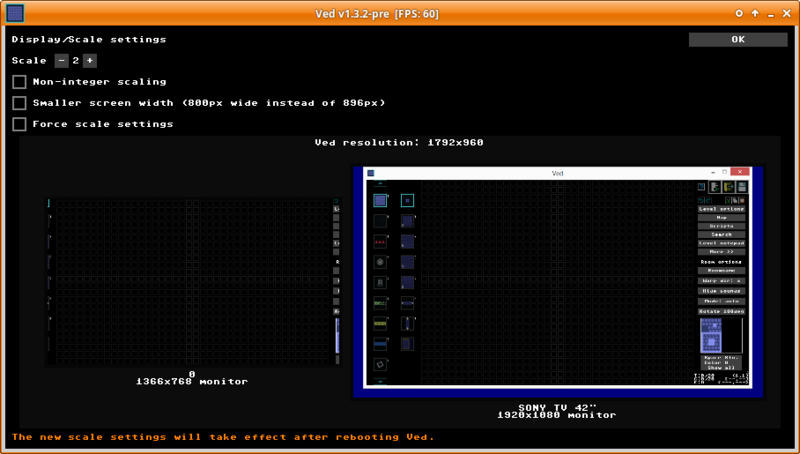 Forgot to remove the resizable option from the internal config, so now you can resize the window freely. Oops I guess. Fixed gravity lines and warp lines going through walls in multi mode (topic=1719.msg46416). This fix also, somehow, fixed a crash that occurred when trying to place a gravity/warp line at the very top of a room with multi mode. Larger text size in the script editor is now supported. The crash screen should now be less susceptible to crashing. Yes, indeed. You can now swap rooms with the button next to the map. The currently selected tile is now indicated in the tile selectors. You can now show the full-screen tiles picker ("Show all") by holding down left ctrl/cmd and left shift! While holding that you can now also select a tile with your arrow keys. 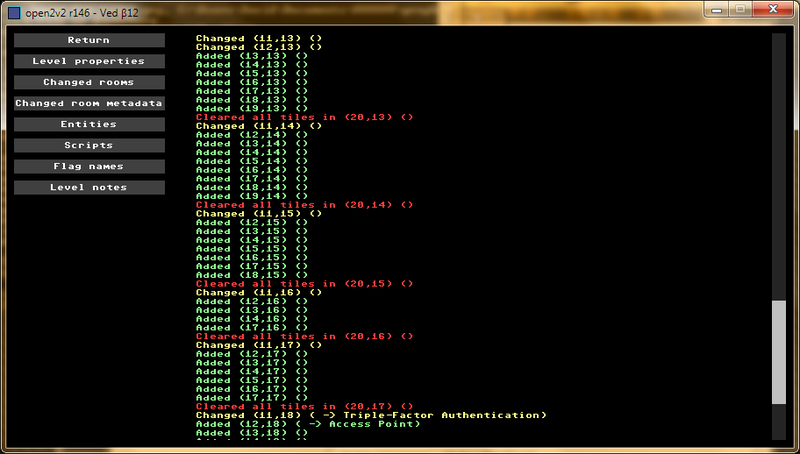 A bug where the first line of internal scripts would be duplicated whenever you closed the script should now be fixed. Internal scripting mode now automatically accounts for the say() blocks needed for internal scripting mode when there are more than 49 lines of internal scripting. Please test this before using, and report if anything weird is going on! If your levels folder has so many levels that they go through the "Load this level:" input, you can finally see what you're typing. You can now press ctrl/cmd+N to make a new level instead of moving your mouse cursor to the icon with a paper and a green plus sign, and clicking on it. • Just turn on the mode for a script and start typing in internal scripting, and Ved will take care of the text(1,0,0,4) and such in the background. • Typing loadscript(stop) is not needed, Ved will also do that. • You will have to make a load script yourself, so directly referencing the script from a terminal or script box will not work. In a later version this will be detected so there can be a warning. • Apparently, internal scripts with more than 49 lines still cause problems. I'll try to find a solution for that, but if you don't want to wait, you could always split the scripts and use customiftrinkets(). Made a part of the options in the right click menu in the scripts list work. Music number box in the level options replaced by a dropdown with all the song names. If you prefer to use song numbers, click on/tab to the dropdown and just type the song number. The button to show/hide enemy and platform bounds now works. The rescuable crewmate tool now has a "random" option. Added a new second automatic mode, where the tiles autocorrect only affects blocks in the currently selected tileset and tilecol, for making rooms with multiple tilesets using automatic mode. It is called multi-tileset mode (or multi mode) (topic=1719.msg45151 and onwards). Made a help article detailing the tileset placement modes. On the map, when copying one room to another, two rooms were already considered to be at the same coordinates if either the X coordinate or the Y coordinate was the same. This has been fixed. You can now choose to display room coordinates as starting at 0. The full horizontal and vertical brush tools have the shortcuts H and B now, respectively. Z, X and C shortcuts now work for the spike tool as well. If you're placing tiles in manual/direct mode now, the tile number of the selected tile will be displayed at the cursor. The Z X C V shortcuts are now shown next to the corresponding wall/background subtool icons. Editing a room name and typing ",", ". ", "<" or ">" will no longer switch tools. When copying a room via the map, the displayed total entity count should now be accurate. Spikes at the top/bottom of the screen that appear to continue offscreen now don't attach themselves to the edge of the room, to make it consistent with the behavior of VVVVVV's automatic tile placement mode. The amount of scripts is now displayed next to the scripts list. Added a screen listing all flags, and whether they're used or not. You can now give flags names and use those in scripts! You can also just make up flag names in scripts, and Ved will automatically associate them with flag numbers. Flag names can contain any printable ASCII character except (, ), ,, and space, and mustn't just consist of digits. If you want to open a script and see the flag numbers instead of names for that time, hold shift while opening it. The flag numbers will be displayed as kind of a comment at the end of lines with flag names in a later version. Implemented new crash screen, where you can press ctrl/cmd+C to copy the error message and some details to the clipboard, and where you can still see the screen from before the crash. Example. In future versions, I'll probably implement a button that allows you to attempt to save the currently loaded level, so even if Ved crashes you wouldn't lose your progress. Note: If Ved simply closes itself at any point, please tell me! You can now cancel cancelable dialogs with escape, and answer yes/no dialogs with the Y/N keys. Auto-adjusting of warp lines and gravity lines now also works correctly for rooms other than 1,1. Added a help page about the formatting codes that can be used in level notes. Buttons for enemy/platform bounds, enemy type and platform speed are now displayed underneath the room options buttons and only when the enemy/moving platform tools are active. This makes sense and creates space for more room-related buttons. F3, F4 and F5 still work as they did before. There are now temporary filler labels. In addition to gravity lines, warp lines now automatically adjust to the room tiles as well. Warp Gravity lines now automatically adjust to tiles being added or removed in their way. The copy function next to the map now works properly (it no longer copies rooms by reference), and copies entities properly now! It just doesn't remove entities that were in the room that gets overwritten. The levels list from cmd is now interpreted as CP850 and converted to UTF-8. The version of LÖVE is now displayed in the title bar in debug mode (which is still always on), if you get a bug/crash from now on, please include the version of LÖVE Ved runs on. You can now move your typing cursor across the line and type/delete in the middle of a text, wherever you can type (not yet in dialogs) (also ia=97613). Being able to move between lines with left and right will be added soon. You can now also use shift+tab to go up in the levels list (instead of just the up key). Double spaces are now encoded as `_ in the metadata entity, to make sure they are preserved when the level is saved with VVVVVV. The level loading list has been improved, when you start typing it now only displays level names that start with what you type and you can also press tab/up/down to select a level from the list. Ved should now no longer crash when you enter blank entity properties. Ved now no longer crashes when placing the top left of a script box, then removing the entity and then placing the bottom right. Clicking "Edit script" on a terminal or script box where the script doesn't exist now gives a warning instead of crashing Ved. You can now press escape to return from the map, scripts list, script editor, help and search. Creating a terminal or script box (or renaming a script) now also creates the script if it doesn't exist already. You can now create and go to scripts by clicking on the button when you're on a line with a command that references a script name (like ifflag) in the script editor. You can now go to the room containing the start point by right-clicking on the start point tool. You can now use the tab key to cycle between input boxes in level options and entity options. And of course shift+tab to cycle backwards. The settings/options can finally be saved and you can return to the previous state without having to use F12. Also, you can change the scale between 1 and 2 from inside Ved now, but make sure that your display is big enough, or you may have to find the config file. Added images functionality to the help system, and used it to make most of the tools article. Multiline pasting now works properly in the script editor! Spikes can finally be placed in automatic mode, and all spike tools are supported now! Added some integrity checks when a level is loaded, this will try to automatically fix errors later. Warp tokens can now be placed! Script boxes can now be placed too! It doesn't yet create scripts automatically though. Help feature added! The documentation is still unfinished though (anyone wanna help? ), but there's a complete simplified scripting reference. Added full support for scaling, you can set it by changing the config. Enemies can now be placed, and their direction is indicated. Viridian (start point) can now also look to the left. You can now place terminals! 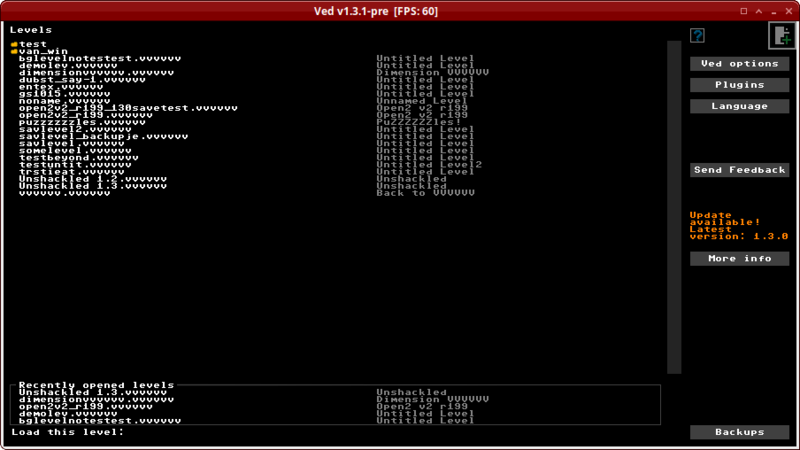 (And terminals and script boxes will now indicate script names.) It will not yet create scripts automatically though, so you'll need to create new scripts separately. You can also edit the script name for a script box. You can now save fullsize map images! Just right click the save button and select the second option. You can now copy rooms and their entities, but beware, it's as unfinished and glitchy as it can be! Warp lines are finally displayed and can be placed! New levels now get the same tilecol by default everywhere as in VVVVVV, instead of space station tilecol 0 everywhere. Platforms are now colored correctly and have indications for what types of platforms they are. Moving platforms and conveyors can now be placed! Enemies are now shown with their correct sprite, and enemy types can be changed for rooms. The color of a selected script line past line 500 is now light red instead of white. Ved will now ask before quitting to make sure you don't accidentally lose unsaved content. This can be turned off. Added most of the support for Linux, for now it'll use new universal love.filesystem functions that will be a fallback in case LÖVE will run on systems other than Windows, OS X or Linux. Nobody probably noticed it but if you removed the start point you couldn't place it anymore, this has now been fixed. Cursor pixel coordinates are now also displayed. Platform speed (platv) can now be set. Crewmates can finally be placed. You can now switch between automatic mode and manual mode (undirect mode and direct mode if you're used to that). There have been many improvements to tileset handling, you can now switch tilesets and colors, and all tilesets and colors have been added! The search feature can now find room names! You can now click on search results to go directly to what you're looking for. The options screen now sort of works for boolean values, it doesn't save to the settings file yet though. And there's no return button yet so you have to F12 out of it. 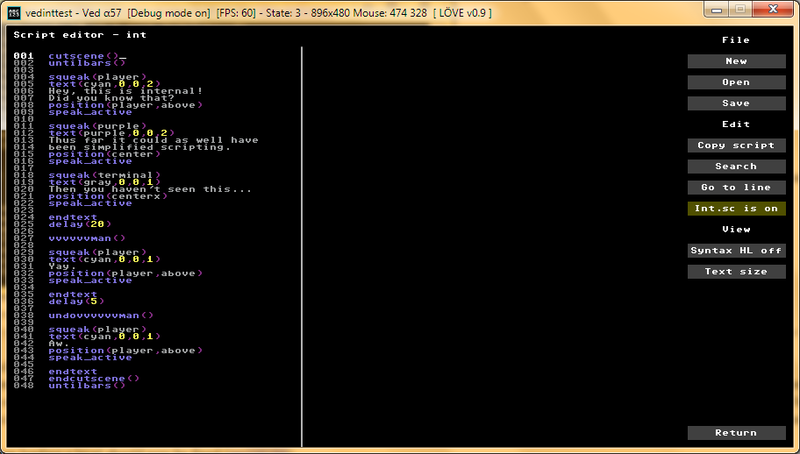 The script editor has improved a lot, and now actually works and saves. You can now hover over rooms on the map to display their coordiantes and name, and click on them to go there. The script list now more or less works! The script editor will however not yet save anything. Added a map feature! You'll be able to click on the rooms and perform actions on them, view their room name etc, later! You can save the map as an image (which has bars on both sides but that doesn't matter for now). It's now a config option whether you want to be able to bypass limits, instead of it being possible by default. Scrolling for subtools is now flipped on Mac because of the way scrolling works on Mac, and can be reversed with config. The spawn point can now be placed, and it will remove the old one. Added a the buttons for most of the coming subtools, they don't work yet, though, and some of the icons have temporary art.